Stereophonics are set to release their new album Keep Calm and Carry On, which was written by lead vocalist Kelly Jones. With 11 top 5 singles, 21 top 20’s and five consecutive No. 1 albums Stereophonics have stood the test of time to become one of Britain’s biggest bands. The title of the album Keep Calm and Carry On, is a message taken from a World War II propaganda poster, and its 12 gems of intelligent, sharply crafted, melodic storytelling, have taken the band in some surprising and extremely enjoyable new directions. It’s the punchy hooks, dynamic percussion and the voice of Kelly Jones which have put the band on the map, and their new album takes this agitated, upbeat vibe to a new level. The record is full of grunge-infused Summer tracks that are a welcomed vibe. 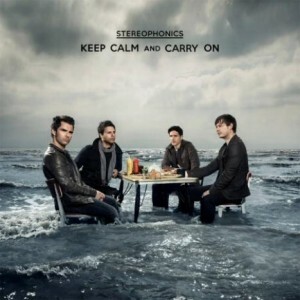 Keep Calm and Carry On takes Stereophonics to new depths, they have introduced new synth to the old sounds of rock and roll and have come out with an album full of passion and individualism.